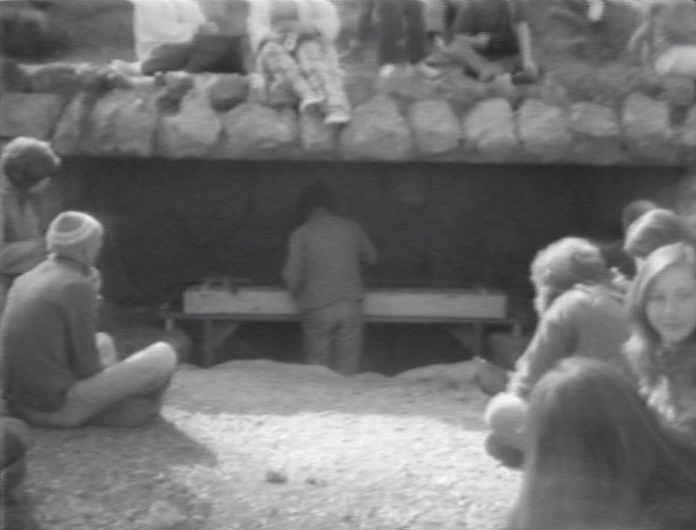 Thirty seven years ago on March 13, 1976, the then-San Francisco artist Terry Fox (1943–2008) performed Timbre for an audience at the Mountain Theatre at Mount Tamalpais. Fox’s text below on his SFMOMA offsite performance was originally published by the nonprofit La Mamelle (1975–1995) and illustrated with photo documentation by Tom Marioni. 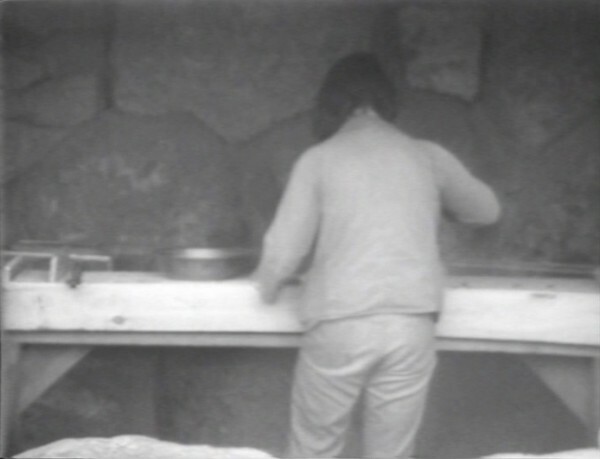 The following video stills were selected from a rare copy of the artist’s video documentation from our archives that I arranged to have digitally transferred. “Timbre: A performance for two instruments: a homemade instrument strung with piano wire, and a Cessna 172 single engine airplane. During a period of two hours the airplane made six passes over the performance area out of sight of the spectators. The instrument emitted a continuous drone for four and a half hours and was tuned to the pitch of the propeller pitch of the airplane. March 1976. Sponsored by the San Francisco Museum of Modern Art. “The stone amphitheatre on Mount Tamalpais is nineteen hundred and fifty feet above the ground floor of the San Francisco Museum of Modern Art, and approximately twenty miles to the Northwest of my studio, which is six blocks from the Museum. The amphitheatre was built in the thirties by the Conservation Corps on a natural, acoustically rich meadow which had been the sight of open air theatre since the early nineteen hundreds. The theatre is near the top of Mount Tamalpais, a state park reserve, and overlooks the San Francisco Bay. 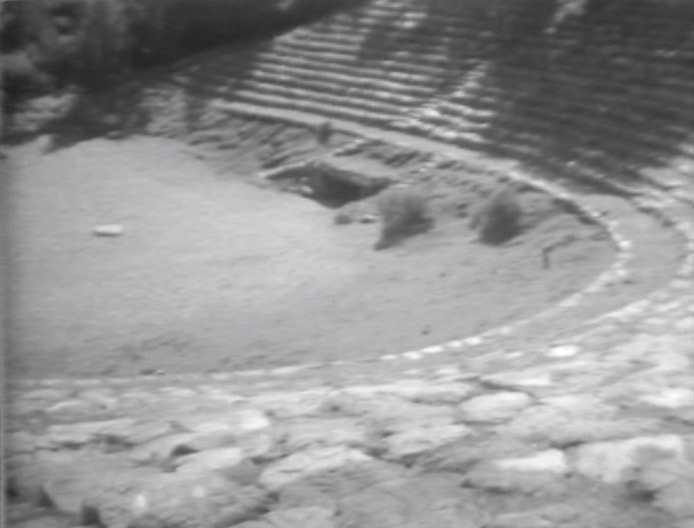 The stage area is a semicircle of earth with a flat stone in its center and small trees as a backdrop and reflecting surface. The stage prompter’s box is hidden from view, recessed under the first tiers of seats, four feet below the surface of the stage. It is designed so that sound issuing from it is directed to the rock in the center of the stage and is inaudible from the seating area of the theatre. “I’m looking at a model of the prompter’s box next to my typewriter. It’s made of the same stone as the actual box, only scaled down. It’s ten inches long and six inches wide and six inches deep in the center, with a two inch stone bench running around three walls of its interior, the fourth wall open and facing me. The ceiling is flat and made of concrete. There is a drain in the recessed floor, but it is plugged by a small rubber mat and the bottom has been filled with an inch of water to create a smooth, flat, reflective surface. A thin wooden box, eight inches long, rests with each end on a stone seat so that it is suspended over the water. It has four metal wires stretched taut along its length, passing over wooden bridges, creating an instrument. A tiny figure is standing in the water and plays the box instrument, striking the strings with a stick the size of a sliver. As I watch, my heart makes my body rock back and forth. I can feel a low pulsating in my stomach. “I begin to hear an engine idling on the street below my open fire door. I live in the middle of the city. I live on a wood floor, smooth and tight. The brick walls, compressed by their own weight, vibrate with the low pulsations from the idling engine. I can hear other objects in the room moving in sympathetic vibration with the pulses from the engine. The spilled salt on the table forms itself into writhing mounds. The wooden floor is strung with piano wires stretched taut over wooden bridges. The wires begin to hum, one the overtones of the other. My floor is a resonating box. My brother’s room, below, is a sound box, reflecting and amplifying the pulses back against the ceiling, my floor. The windows rattle, the empty glass on the table begins to sing a low, deep note. As I watch the figure in the model, the rumbling of the idling engine becomes a low but discernable note and an object enters my field of vision from the left, just behind my shoulder. 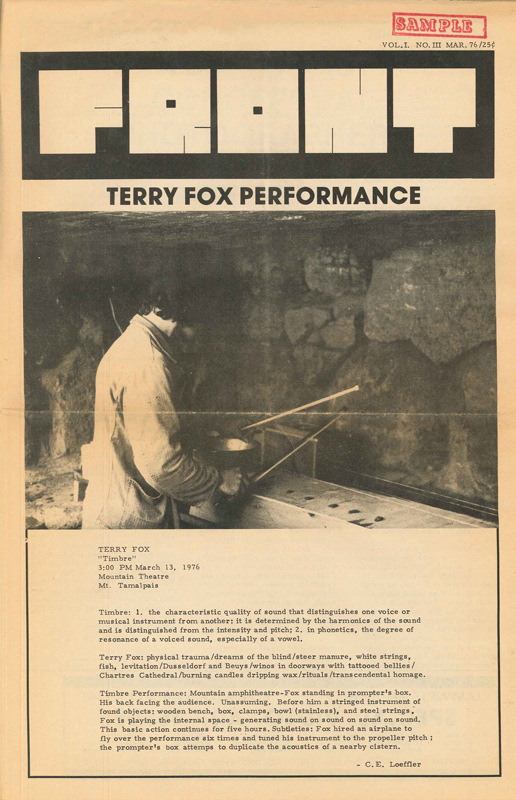 Postcard for Terry Fox’s Timbre, March 13, 1976; performance as part of the San Francisco presentation of Exchange: DFW/SFO, January 23–March 7, 1976, co-organized by SFMOMA and the Fort Worth Art Museum; 3 1/2 x 5 in. Carl E. Loeffler, “Terry Fox Performance,” Front , no. 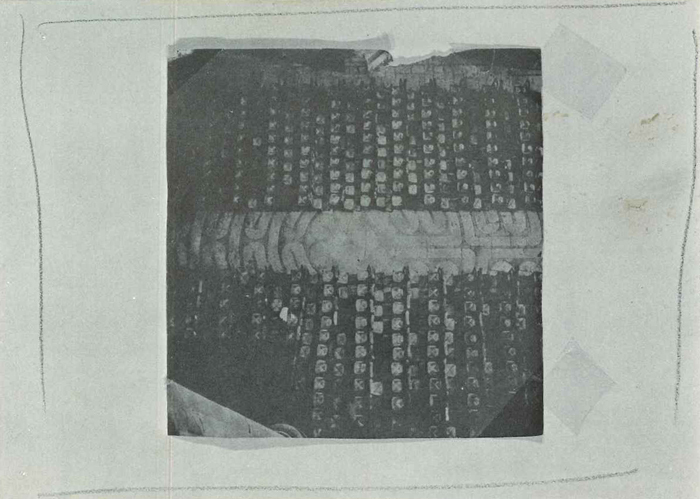 3, vol.2, March 1976, p.1, 17 x 11 in. that fly is no longer there. he’s now a permanent resident at the Chartres Cathedral. He spends his days scanning the labyrinth endlessly. Driving to Mt. Tamalpais seemed like it was part of the experience of Terry Fox’s performance, Timbre. Then to meet a small group of people who were there, the smell of the forest, and to listen as the day began to warm… it was all a part of something that I still hold somewhere in the back of my mind. Thanks for sharing your experience of the piece. The first part of the video features Terry recording his own walk along the path to the performance site. has a potential buyer please request a photo via email. Thanks for the memory.